more JOY everywhere! : What's in a Name? Today, not unlike the last going on four weeks worth of days, we are in Marathon, FL waiting for our JOY to receive transplants of most of her "organs." Marathon, as evidenced by its one road, the Overseas Highway which connects all the keys to the Florida mainland, is a drive-through town. This is not only our opinion, but also that of the several residents I've surveyed. Even they say that there's not a lot to do here for fun; for fun there's Key Largo and Key West. Marathon's draw is its affordability. Live here, play somewhere else. This begs the question of what we do here day after day while JOY remains barely inhabitable for the want of innards. We got lucky with our slip assignment. Jane asked for a spot as close to a wi-fi antenna as possible which also happened to be next to a spacious tiki hut. Most of our days are spent here. Jane orders things we need, keeps up with her facebook pals, writes posts to our blog and to Cruiser's Forum, and keeps track of things political--all with her iPad. I mainly work on our website. One day we moved our pc, our mac, our printer, our scanner, and our new portable refrigerator out there and got a lot of "officey" things done. Well, Jane did. I mainly worked on our website. We affirm our love for that tiki hut daily. On other days we run errands. This entails a two-plus mile walk across town along Overseas Hwy., a very busy, very noisy walk. Everything we need or want is somewhere along this road: The Home Depot, West Marine, the liquor store, the post office, and last but not least, the grocery store. Probably a good thing, all in all that the grocery store is furthest away. We wouldn't be anywhere near as productive or responsible if we didn't have to pass all the other places first. We don't walk back though, we take a cab ($5 to/from anywhere on the island). With or without a heavy load, walking not 6 feet away from 18 wheelers once a day is more than enough. We do have an opportunity to walk around the marina once a day to check the office for packages. This gives us a chance to engage in one of our newfound pastimes--collecting boat names. I'm not sure what the rules are in other parts of the world regarding naming one's vessel (the U.S. Coast Guard requires that all boats registered with them be named), but everyone does it regardless. Not naming one's boat is probably as bizarre as not naming one's kid. And as every author knows, names reveal a lot; if not about the boat per se, then certainly about her owners. We do this, of course, for its entertainment value. What can we say? Dissing other boat owners' choices is cheap fun. Generally speaking, puns and names that require hyphens are most vulnerable to our ridicule. Name your boat something like "Luna Sea," "Prima Sea," or "Sea Duction" and you're just asking for it. Along these same lines, but maybe slightly more clever thus marginally less mockable are "Pair-O'-Docs" (owned by a couple who are doctors),"Toucan Dream," "Aquaholic," and "Conched Out." Conversely, some names, names that flirt with crudity like "Nauti-Buoy" and "Nauti-Dream," or names, like "Breaking Wind" that just are crude aren't even worth gibing (pun intended). Catamaran and fishing boat owners seem especially susceptible to pun-ishing the rest of us. Thus we have "Catywhompus," "Felix the Cat," "Cat's Paw," "Fat Cat" in the former cat-egory and "Reel Love," "Reel Deal," and "Reel Lucky" in the latter. There are names that betray a sad lack of wit. Not that everything in this world has to be clever, but originality (don't they want to think of their boats as unique?) doesn't seem like too much to ask. In truth, though, seeing a blah moniker emblazoned on the bow or transom of a boat clues us that our underabundance of social skills would be better expended elsewhere, on more likeminded souls. So we are actually appreciative of these for their helpfulness, if not their capacity to amuse. Chief among the names in this group is "Carpe Diem" followed closely by any name incorporating the words "wind," e.g., "Windsong," "Windward," "Wind Spirit," and "Second Wind." Closely related to this category are boat names that are ironically both arrogant and generic: "Relentless," "Intrepid," "Justified" and one of our all-time favorites, "Celebration of Life." Of this last one Jane inquired one day, "Isn't that what they call a memorial service?" Occasionally, we come across names that make no sense whatsoever. We dislike these because we don't know if we should cast (get it, cast?) aspersions on them or not. What is one to make of "Canoe Underwater," Why Not Floating," "Anything In It," "Southern Vectis," and "And We Danced?" All too seldom, we find a name that makes us smile...in a good way. "O Blah Dee" and "Oubliette" are among the rare few that are just charming enough. If, somewhere along here you've been thinking to yourself: "Hey, more JOY everywhere!, I wouldn't be so glib if I were you. What do you think people do to your name when you're not in earshot?" We're way ahead of you. Yes, it's true. We have a remark-upon-able boat name. We know for a fact that, at least among USCG registered vessels, it is a unique name ("More Joy" incidentally, is not). 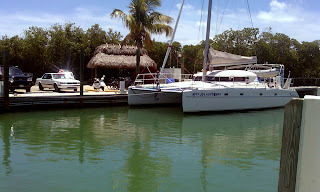 We discovered this when reserving a mooring ball at the Boot Key Harbor Marina. Playing a hunch, the dockmaster looked us up in the Coast Guard registration database and was able to fill out our marina registration form for us. Spooky. As it happens we've not heard anything but effusions of approval on our name--until recently. What went around has come back around. Our chickens have come home to roost. "More JOY everywhere" is amenable to all sort of correlates so we've discovered. And these haven't been just cracks made by smart-alecky passersby, but sincere attempts to record our name on work orders. Accordingly, we introduce to you the good ship, "More Happy Everywhere," "More Joy to Everyone," "Everyone has Joy," "Everyone Joyful," "Happiness to Everyone," "More Happiness Together," "Happy People Everywhere," Happy People's Catamaran," and, combined with our hailing port (Happy Camp, CA), "Happy Campers Everywhere." We take from these parodies two things: First, we're having a freakin' lot of work done on this boat, and second, there must be too little joy in this world if people can't distinguish it from happiness. We hope to serve as a small reminder of the difference.